iMindMap is a powerful and robust mind mapping and visual thinking software that combines mind mapping, brainstorming and project planning capabilities into a single platform. It is designed to empower users to unleash their creativity and collaborate with other workers within a digital working environment conducive to idea generation, discussion, and teamwork. The software is created to fuel idea generation and development via creative, visual thinking. iMindMap is loaded with a variety of features and tools as well as views that empower users to bring out their creative juices, spark new ideas, develop and transform them, and ultimately turn them into realizations, either as tangible products or viable plans ready for implementation. iMIndMap is a highly visual mind mapping software that utilizes a wide array of graphical tools and elements to help you create and organize ideas and concepts, nurture your thoughts, and turn them into reality. Branded as one of the best mind mapping platforms in the market today, iMindMap utilizes the elements of color, imagery, and visual-spatial arrangement to encourage you and your fellow users to improve your mind mapping activities. Visual cues and tools have proven to highly effective in improving recall in contrast to conventional practices such as note-taking and learning by rote. iMindMap’s vivid approach to mind mapping helps ensure this. In any brainstorming session, creativity is essential. iMindMap provides you with a rich throng of tools and features such as large image and icon libraries to fuel creativity and inventiveness and Smart Layout to help you structure your mind maps in the tidiest, most organized way, spatial-wise. The spatial layout delivers a better overview of your ideas and projects, allowing you to see more possibilities and connections and play with your thoughts and concepts and associations on any topic. Visually loud mind maps are quite effective in creating and implementing plans. iMindMap’s visualization makes it easy for you and your team to comprehend even the most complicated data, exercise your thinking skills, and spot opportunities. If you are considering iMindMap it may also be sensible to analyze other subcategories of Best Mind Mapping Software gathered in our base of B2B software reviews. Every business has its own characteristics, and might call for a specific Mind Mapping Software solution that will be adjusted to their company size, type of customers and staff and even particular niche they deal with. It's not wise to count on locating an ideal app that will be suitable for every company regardless of their history is. It may be a good idea to read a few iMindMap reviews first and even then you should pay attention to what the service is supposed to do for your company and your staff. Do you require an easy and straightforward solution with just elementary functions? Will you actually make use of the complex functionalities required by pros and big enterprises? Are there any particular tools that are especially useful for the industry you work in? If you ask yourself these questions it is going to be much easier to get a solid software that will match your budget. How Much Does iMindMap Cost? iMindMap offers the following basic and enterprise pricing license packages. Give the details a look, and select the best plan for your business. 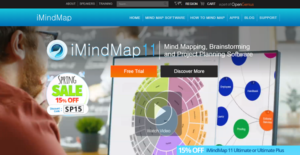 We realize that when you make a decision to buy Mind Mapping Software it’s important not only to see how experts evaluate it in their reviews, but also to find out if the real people and companies that buy it are actually satisfied with the product. That’s why we’ve created our behavior-based Customer Satisfaction Algorithm™ that gathers customer reviews, comments and iMindMap reviews across a wide range of social media sites. The data is then presented in an easy to digest form showing how many people had positive and negative experience with iMindMap. With that information at hand you should be equipped to make an informed buying decision that you won’t regret. What are iMindMap pricing details? What integrations are available for iMindMap? If you need more information about iMindMap or you simply have a question let us know what you need and we’ll forward your request directly to the vendor.